1. Preheat the oven to 180ºC, gas mark 4. Butter and base line 2 x 20cm round sandwich tins. Cream the butter and sugar together in a mixing bowl with the lemon zest, until very light and fluffy. To the mixture add the eggs, a little at a time, beating each addition in well before adding the next. 2. Sift the flour with the baking powder and carefully fold into the wet mixture, with the lemon juice, to give a soft dropping consistency. Divide between the tins and spread level. Bake for 25–30 minutes until well risen and a skewer emerges clean. Turn onto wire racks and cool. 3. To make the icing, melt the chocolate over a pan of simmering water. Cool for 5 minutes then beat into the butter. Gradually beat in the icing sugar and add 1 tbsp water, if needed. Cut each cake in half horizontally. Sandwich with the lemon curd then spread a layer of icing between the two cakes to stick them together. Spread the remaining icing all over. 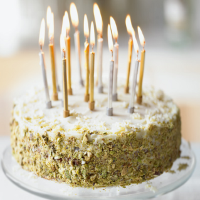 Press the pistachio nuts around the side and decorate with the chocolate stars and candles.